A new end-of-summer event, Summermusik, featuring the Cincinnati Chamber Orchestra and its musicians, got off to an auspicious start Saturday night in Corbett Theater at the School for Creative and Performing Arts in Cincinnati. Entitled “The Food of Love,” the concert had a Shakespearean theme, including “Hamlet: Suite from the Theatre,” Op. 32a, by Shostakovich. A montage of music and theater, this work featured actors from the Cincinnati Shakespeare Company, Cincinnati’s resident ensemble theatre company. The concert opened with of the Overture to “Gli equivoci,” an opera buffa based on Shakespeare’s “The Comedy of Errors,” by eighteenth-century English composer Stephen Storace. 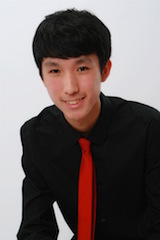 Conducting the CCO was interim music director Kelly Kuo (a search is underway for the next CCO music director). Storace’s 1786 overture made a fine curtain raiser. Notable for its “storm” music, with cymbal and timpani providing tone painting, it was, according to the CCO, only its second performance in the United States. (The opera was given its American premiere in 1980 at the University of California at Santa Barbara.) Storace and his sister, soprano Nancy Storace, were friends and confidantes of Mozart (Mozart created the role of Susanna in “The Marriage of Figaro” for her) and the influence showed in its cheeky brevity. Shostakovich’s “Hamlet” Suite -- excerpts from music written for a 1932 stage production in Moscow, not the 1964 film -- was semi-staged with entrances and exits by the actors. As compiled by Kuo, CSC artistic associate Jeremy Dubin and the actors themselves, it came across as more sarcastic than philosophical, with a brash, fanfare-like opening movement and music for Ophelia that was more frantic and forceful than feminine. Brent Vintrup of the Cincinnati Shakespeare Company made an assertive Hamlet, with Kelly Mengelkoch tossing flowers as Ophelia and Jim Hopkins as a challenging Claudius. Hamlet’s “Get thee to a nunnery!” spoken to Ophelia was followed by a tempestuous orchestral episode, and even the “Dies Irae” appeared at one point. There was an outpouring of grief by the CCO followed by triumphal music, as Hamlet lay dead at the end. In short, it was a performance piece well worth repeating. Lu’s performance of the Chopin Concerto was everything it should be. Performing on a nine-foot Steinway, he filled it with color and gesture. The opening Allegro Maestoso sparkled, with every nuance given thoughtful attention. He displayed a tender touch in the Larghetto second movement, with pristine phrasing and precise ensemble with the CSO. Indeed, you could have heard a pin drop in the silence between the second and third movements, so deep was the impression Lu made. There was tremendous virtuosity in the Rondo Vivace finale, an exercise in unalloyed exuberance, which brought the crowd to its feet in a unanimous ovation. For an encore, he performed more Chopin, the beauteous, supple “Raindrop” Prelude, Op. 28, No. 15, in D-flat Major. It raised anticipation for Lu’s all-Chopin recital, to take place the following afternoon on the second Summermusik program of the season at the University of Cincinnati College-Conservatory of Music.